Oracle will launch the first of its machine-learning powered Adaptive Intelligent Apps this spring, but what’s next for Oracle Data Cloud? Here’s a look at promised and possible use cases. The first of five promised Oracle Adaptive Intelligent Application (AI Apps) will be generally available this spring. As for next steps for the petabyte-scale treasure trove known as the Oracle Data Cloud, we’ll have to wait and see. The AI App plans emerged at the January 17 Oracle Cloud Analyst Summit in New York. The event also saw Oracle’s President, Thomas Kurian, repeat a year-old promise that the Oracle Data Cloud will see use in Oracle applications outside of the marketing domain. Oracle AI Apps are, in fact, part of the story of what’s next for Oracle Data Cloud, as I’ll explain, but first let’s review each offering. The first of five planned Oracle Adaptive Intelligent Applications is expected to go into beta testing in February and general availability in May. Oracle Adaptive Intelligent Applications are the vendor’s entry into the hot, fast-growing category of “smart” applications variously associated with artificial intelligence, cognitive computing and (usually most accurately) machine learning. AI Apps will be optional (extra-cost) applications complementing Oracle’s customer experience, human capital management, supply chain management and ERP software as a service (SaaS) clouds. The new news at the Oracle Cloud Analyst Summit was that the first AI App, Adaptive Intelligent Offers, will launch this spring. Clive Swan, senior VP, applications development, said that two to three additional AI Apps will be available later this year. Swan also briefly described the machine learning service that will power the AI Apps, explaining that it will automate personalization for each customer through auto feature selection, auto feature engineering and auto hyperparameter tuning. “This lets us scale operationally without data science intervention on a per-customer basis,” he said. As I detail in my in-depth report, Inside Oracle Adaptive Intelligent Apps, it takes Web-scale data, massive compute capacity, advanced data science capabilities and lots of time to develop machine-learning driven applications that can deliver smart recommendations or, even-better, automated actions. Oracle has the data it needs, starting with aggregated and customer-specific histories from its respective SaaS clouds. But this is also where the Oracle Data Cloud comes in, with its petabytes of data, billions of consumer profiles, 400 million professional profiles and 100 million business profiles. The data is already modeled and ready for use in supporting sales, marketing and service decisions. Oracle also has vast and growing cloud compute capacity, with 19 data centers around the globe and counting. Data science and time seem to be the only holdups on AI Apps. Oracle’s official announcement at Oracle Open World noted that it would take 12 to 18 months to deliver AI Apps. The spring release now expected would be just six to eight months after the announcement. As Swan explained it, time was needed to develop and test the automated machine learning capabilities. Among the vendors exploring AI, Oracle’s app-centric strategy mostly closely matches that of Salesforce. The latter says it spent more than two years developing the automated machine learning behind the Salesforce Einstein apps announced last fall. Salesforce also spent more than $4 billion on AI-related acquisitions last year. This has contributing to the company’s head start. As I detail in this blog, Salesforce has 11 Einstein apps that are generally available, six more due in February and an 15 additional apps expected before the end of the year. Oracle contrasts its strategy with that of Salesforce noting that it’s apps will include supervisory controls that will enable business users to boost, constrain or even override machine-generated results to fine-tune results and meet specific business objectives. Oracle also says its apps won’t be limited to the sales, service and marketing domains, although it, too, is starting with customer-experience related applications. Oracle says it will eventually have many more than five AI Apps, but for now, Salesforce has the advantage in terms of availability and diversity of AI apps. Oracle ID Graph is a feature of Oracle Data Cloud that enables tracking of unique consumer behaviors and, thus, targeted marketing across channels. 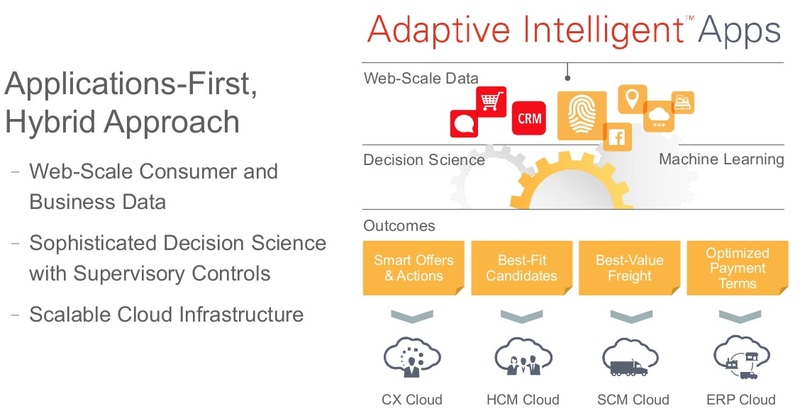 It’s no coincidence that the next step for Oracle AI Apps – into the HCM, SCM and ERP domains – are also the next frontier for Oracle Data Cloud. Built on the acquisitions of Blue Kai, DataLogix, Add This and Crosswise, Oracle Data Cloud has heretofore been all about powering data-driven campaigns and marketing data enrichment. With the Oracle ID Graph capability, Data Cloud also helps marketers better recognize, understand and target consumers and business professionals across devices (desktop, tablet, mobile) and across channels (web sites, email, mobile apps, social networks). It was at last year’s Cloud Analyst Summit that Kurian first vowed that Oracle Data Cloud enrichment opportunities would extend beyond marketing and into HCM, SCM, ERP and other areas. At last week’s event Kurian was asked about progress, and he reiterated that more is to come. “We didn’t just get into the data business; we wanted to solve a high-value problem,” Kurian said, talking at length about the value of Oracle ID Graph. “Oracle Data Cloud lets us drive differentiated business process outcomes… [and] they’re not just marketing centric.” He cited procurement, replenishment and HR as potential use cases for ID Graph. Whether it’s Oracle AI Apps or the Oracle Data Cloud, applications outside of the marketing and sales domains are going to take longer for Oracle to develop. Oracle added business-to-business data to Oracle Data Cloud late last summer, and the associated business and professional profiles would presumably help drive SCM, ERP and, possibly, HCM use cases. Oracle also expects to exploit aggregated data from its various SaaS applications, but that may require new data agreements before the company can tap yet more data to bring context and insight to smart applications. For now, Oracle Data Cloud is an incredibly powerful and unique resource for marketers, but its potential as an engine for AI Apps and conventional apps outside of the CRM realm has yet to be realized. I have no doubt that Oracle will get there, but it’s an objective that remains on the horizon. You have performed a great job. I will definitely dig it and for my part recommend to my friends. I’m sure they will be benefited from this site. very good and interesting post, your website gives us best information. This is just the kind of information that I had been looking for.